Mortgages…is there anything positive to say? Let’s be honest, mortgages get a bad rap. Okay, so there are obvious reasons that they do. They usually stick with most people until they’re aged, they are difficult to pay off, and let’s not talk about interest rates or PMI (private mortgage insurance). Today I want to dig a little deeper and tell you about “re-casting”. 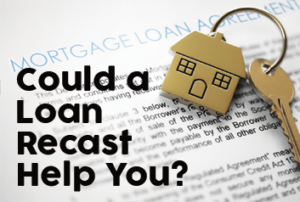 Re-casting a loan means that you are putting a significant amount of money (typically at least $5000) towards your principal balance and wanting it to not only to reflect on the principal amount owed, but allow for the payment structure to be reflective of the new loan amount. Same rate, but the principal and interest requirements are re-calculated to reflect the new loan amount, so they would be lower. Typically the cost to do this is $250. In certain scenarios (within 6 months of acquiring the property), a buyer who initially paid mortgage insurance on their new loan can re-cast the loan and get rid of mortgage insurance as well without obtaining a new appraisal, assuming the amount they apply towards the loan amount reduces the loan to value to 80% of the acquisition price. There are restrictions per different lenders on this, so this is a case by case scenario. This really comes into play when you have a good deal of equity in your home but will not be selling prior to the new home purchase. You could typically get a bridge loan (basically a home equity loan) to access the equity in the current home to use as a down payment on the new home but the cost of these loans can be upwards of $850 and the time to process these loans may not fit with when you are wanting to close on the new home. An option without having to get a bridge loan would be put 5-10% down with other funds to purchase the new home. You would need to qualify assuming owning both homes which can be the issue here. When the current home sells, take the large amount of equity/ proceeds from the sale and apply it to the new home loan amount. This is where you would not just apply it to the principal but actually re-cast the loan so the principal and interest is based on the new loan amount. Translation: the payment could be much lower because the same rate is applied to a much smaller loan amount. Whew! Are you lost? Contact a mortgage professional to get more detailed information. 10 Features That Can Help a Home Sell Faster!